When interventional radiologist Keith Woodward, MD, repairs an aneurysm, Adam Hill stands beside him and hands him the instruments. But on a recent November afternoon, Adam, who works in the interventional radiology lab at Fort Sanders Regional’s Comprehensive Stroke Center, was in a different position. He was Dr. Woodward’s patient. 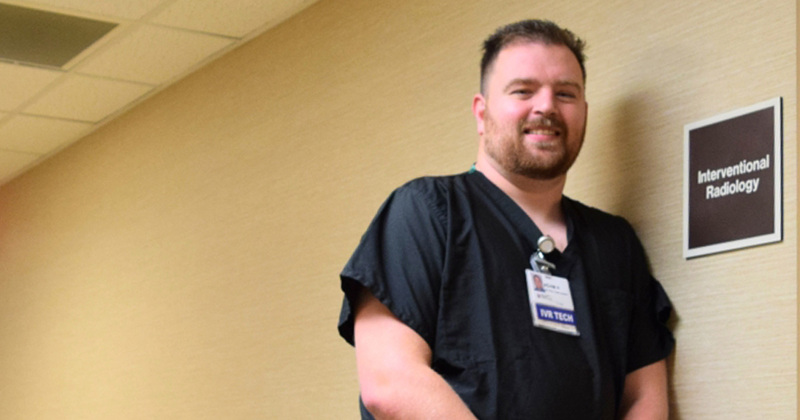 A brain aneurysm in an artery near his right ear had ruptured several hours earlier, causing a subarachnoid hemorrhage and giving Hill a 13-day hospital stay with a close-up view of Fort Sanders Regional’s heralded stroke care. The night it happened Hill was “on call for strokes,” but when a call came around 3 a.m., the young father of two was battling what he described as “the worst headache I’ve ever had.” Although he recognized that as a symptom of an aneurysm, he thought he was “just being paranoid” and brushed the possibility aside. After all, headaches and nausea were not uncommon for him. Hours passed; the pain didn’t. When he saw that his balance was also “off,” Hill’s suspicions of a cerebral hemorrhage grew. Those suspicions were shared by emergency room physician, Douglas Campbell, MD, after Hill and his wife Melissa arrived at the Fort Sanders Regional Emergency entrance around 11:15 a.m. But if Dr. Woodward was shaken, it didn’t show as he performed an embolization using a technique known as endovascular coiling. The procedure accesses the femoral artery through a tiny incision in the groin. The radiologist uses a wire to guide the catheter through the aorta, up through the neck and into the site of the aneurysm. The guide wire is then removed and a contrast dye injected via the catheter to give clear radiographic images of the artery and aneurysm. A microcatheter is then slipped into the larger catheter and used to carry spring-shaped platinum coils about twice the thickness of a human hair into the aneurysm. The coils are then “packed” into the sac, forming a mesh similar to steel wool. Blood cells are caught and clot on this mesh, sealing off the aneurysm from the artery circulation. A post-procedure checkup by occupational and physical therapists determined that Hill had not only survived his aneurysm rupture (50 percent of patients do not) but did so with no disabilities or deficits. Still, because younger patients are more susceptible to vasospasms, a dangerous after-effect of a rupture, he remained hospitalized at Fort Sanders Regional for 13 days as they kept close watch on him.